They say everyone is either a beach person or a mountain person. We don't think you should have to choose which is why the Surf Shack is vacation perfection. This high-end mountain cabin is situated in the community of Pitchfork halfway in between the historic town of Crested Butte and Crested Butte Mountain Resort. With a fun island theme but just minutes from world class skiing and outdoor activities this cabin is special indeed!. Incredible mountain views are abundant off the deck and from the living room, while the kitchen windows offers views of the mountains and open ranch land. This home was originally built and outfitted for one of Crested Butte's luxury home builders so the list of upgrades for this retreat is long. There are three bedrooms: a private master with king bed and en-suite bath with steam shower on the lower level , two bedrooms on the ground floor level with a queen bed, and a bunk room with a twin bunks giving this property the ability to sleep 6. Attached to the home is also a 1 car garage for all of your toys while here in CB. Location, location, location is what they always say you look for in a home and this vacation home has it! Less than a two minute walk from your front door is the free mountain shuttle which can have you on the slopes or down in town shopping in less than 10 minutes. 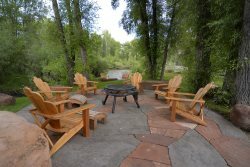 With such a relaxed feel and all the amenities you could ask for, you can just sit back and enjoy what most people call paradise, Crested Butte! Definitely our favorite place to stay. It's relaxing, quiet, cozy, clean, and comfortable, well-maintained. The house is amazing and so close to the mountain as well as easy access to the town of Crested Butte. Sleeps 7 people very comfortably and has all the amenities you will need for a vacation away. Walking distance to the base of the resort and access to numerous mountain biking trails from the front door. My wife and i have spent a few weekends over the winter at this house. What a great location - beautiful mountain views, right on the bus route to town and the mountain, quiet retreat away from the city. We will be going back again soon. The layout of the house is nice because the upstairs has a large area for everyone to hang out. The bed rooms are a good size and allow for everyone to have a nice quiet location on a different floor from the main gathering area. great experience! The staff was friendly and prompt with my questions and inquiry to the property. The assistance needed during our stay was just the same. The SurfShack was an amazing property to stay at. It was close to the bus stop so a rental car was not necessary. Everyone had their privacy and space. The property has a lot of great amenities including the steam shower. Great property and property management company! !